﻿ Best Price on Cala Lodge in Monteverde + Reviews! Located 5 minutes’ drive from Santa Elena town center, and 6.2 mi from Monteverde, Costa Rica. Cala Lodge is surrounded by nature and offers stunning mountain views. 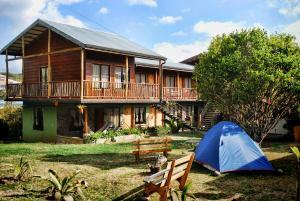 The suites and room have a rustic-style décor and full bathrooms. Some may include a spa bath. The bed linen and towels are included. Guests will have access to a shared kitchen that includes a microwave. There is also a sun terrace where guests can relax and enjoy. Daniel Oduber Quirós International Airport can be reached in about 2 hours and 40 minutes by car.